We recently spent 3 days in the Lamington National Park as guests of O’Reillys Rainforest Retreat. We’ve stayed once before many years ago and it’s incredible being right there surrounded by the rainforest 24/7 but still with all the comforts you could wish for. The area is great on a day trip which we have done many times but dawn and dusk are extra special in the rainforest. With many of the birds and animals more active and visible we make sure we’re out and about as the sun goes down and very early in the morning. There’s also very little light pollution up there so the night sky is spectacular. You’ll hear “O’Reillys” and the “Green Mountain section” used interchangeably to describe this part of the Lamington National park and differentiate it from the Binna Burra section. The location is high on the ridge with a westerly aspect which means it provides some spectacular sunsets. More importantly, it’s the starting point for many of the walking tracks in the Green Mountain section of Lamington. We arrived early in the day and couldn’t resist heading straight out onto the trails. We grabbed our camera gear and water bottles and headed straight for the Border track splitting off part way down to explore Picnic Rock and Elabana Falls. It’s around 8km on an easy walking track with a little boulder hopping and scrambling if you want the best views at both sites. 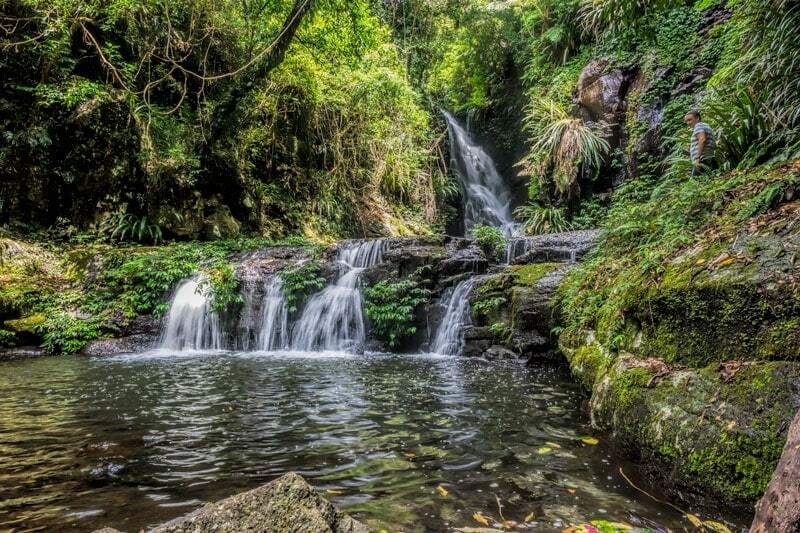 Elabana Falls is now a contender for top spot in my hiking trails in South East Queensland list, a position until now held by the Twin Falls track, take a look at these falls! Lamington was declared a National Park in 1915 and is part of a UNESCO World Heritage area known as the Gondwana Rainforests of Australia. The region as we know it today began forming 23 million years ago. The Australian continent had separated from Antarctica and was drifting north amid rising sea levels. The Tweed shield volcano stood 2000 metres high with it’s cone being what we now call Mt Barney. It’s eruptions sent lava and huge boulders as far as the coast and formed the dramatic landscapes of the Lamington, Springbrook and Mount Tamborine National Parks. Over time erosion, movement and sediment continued to change the landscape resulting in the sub-tropical rainforest we now enjoy. The Gondwana Rainforests of Australia are the most extensive subtropical rainforest in the world and also comprise large tracts of warm temperate rainforest where you will find almost all the remaining ancient Antarctic beech trees. There are few other places on the planet that contain so many plants and animals that remain so close to their ancestral forms. For anyone who loves nature it’s paradise. 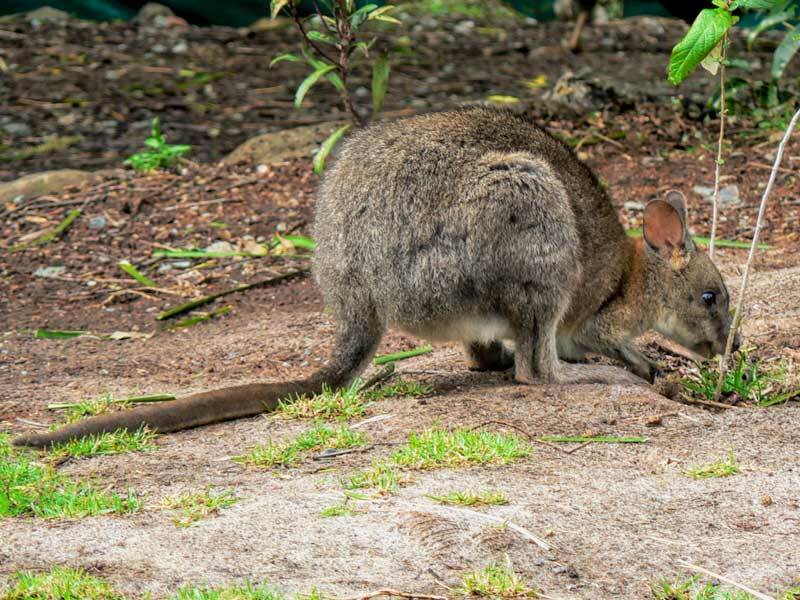 Before you’ve even left the carpark you’re likely to spot birds in the trees and perhaps a cheeky little pademelon (a small macropod like a tiny kangaroo) peeking out at you from the surrounding bushes. 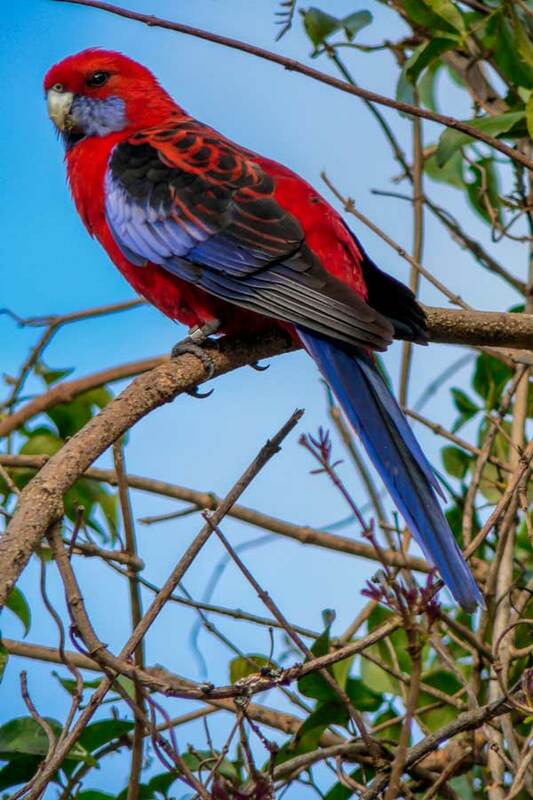 As you head up into the grounds of O’Reillys and towards the start of the tracks you’ll be greeted by a range of colourful birds but the most noticable are the coloured parrots, mostly the scarlet rosella and king parrots. On all the walking tracks you’ll see a variety of rainforest birds too. We were especially impressed by the variety and ease of spotting many on the Booyong track, a boardwalk on the O’Reillys Rainforest Retreat. It makes it accessible to those with very young children or with limited mobility who may be unable to navigate some of the other trails. On the tracks we also saw red necked pademelon in the forest and a variety of geckos. 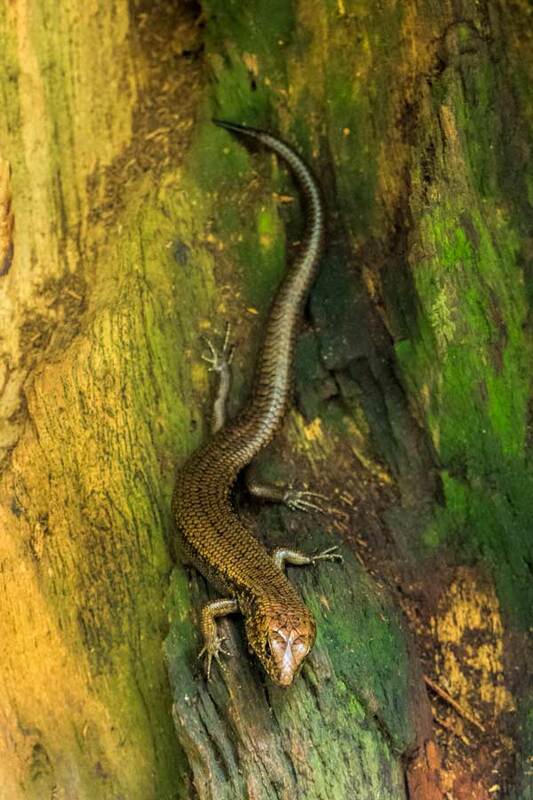 I was especially pleased to add to our tally a few elusive species including the Alberts Lyrebird, the Spiny Blue Crayfish, the Land Mullet and Fleays Barred Frog. The crayfish and frog we hadn’t managed to see before so they were especially exciting. We returned from our hike to the falls feeling slightly stretched and with a renewed love for the National Park. We stopped by reception to check in so we could drop our gear and freshen up before the afternoon activities. There’s a range of accommodation but this stay we are in one of the villas. They are slightly away from the main resort and at the luxury end of the accommodation options. They are each free-standing units with their own undercover car parking at the door. Set into the mountain, the placement together with the gradient ensures your privacy and a feeling of seclusion. The open plan living area feels spacious and swinging open the double bifold doors to the full-width deck allows the cooling breeze to roll up from the valley. Very refreshing on a hot summers day as I collapse in the outdoor chairs with a cold drink. 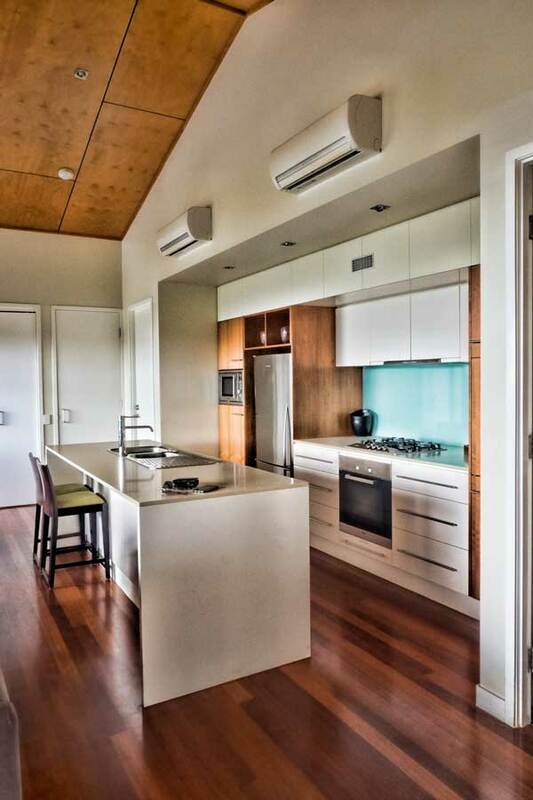 There is air conditioning and fans if you want them and for winter visits that fireplace looks really cosy. I unpacked into the ample cupboard space and stowed my empty suitcase. Eyeing up the outdoor spa bath on the deck wistfully I decide it would need to wait for later. There was the O’Reillys home baked afternoon tea to attend to, walking paths to explore and a champagne sunset tour all awaiting us before dinner. There’s no shortage of things to do on the mountain. O’Reillys Rainforest Retreat offers a range of activities, transfers and guided walks for guests. Some are free, others are inclusions when you stay and some are charged activities. If you’re new to Queensland’s National Parks and don’t have an extensive knowledge of Australia’s birds and wildlife this early morning walk is a good place to start. You’ll come away having learned a lot and probably have seen a surprising amount more than you would have if you completed the same circuit on your own. You’ll also work up a good appetite to tackle the breakfast buffet back at the lodge. The itinerary for these is changed up regularly to make the most of the various westerly vistas around the property. We’ve done it twice and loved the view from both spots as the sun went down. The first photo is from the platform up from Moran Falls and the second is from Moonlight Crag. 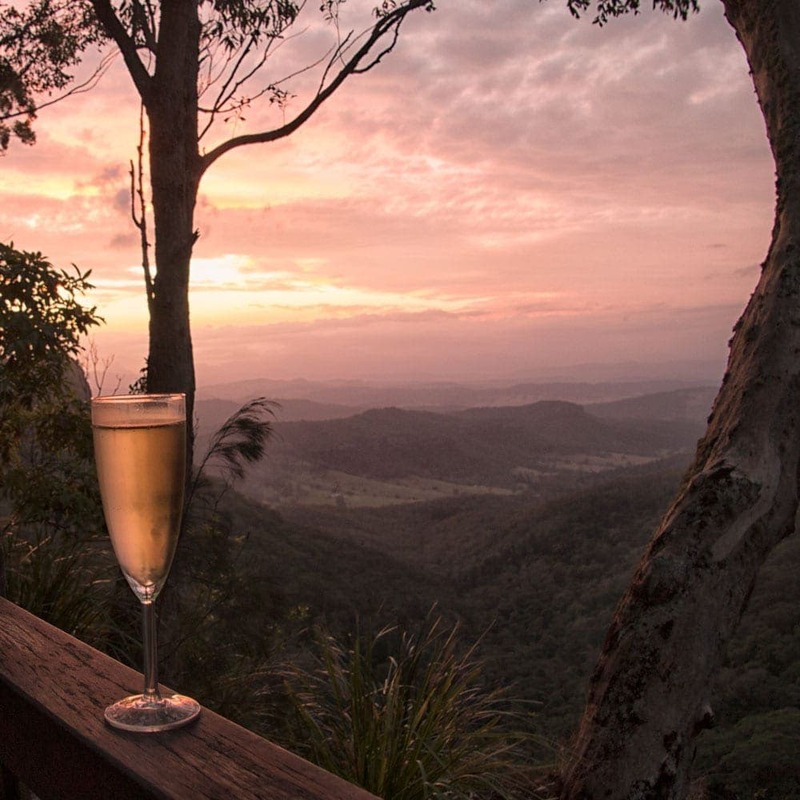 You are transported to the spot and served a glass (or 3) of bubbles as the sun goes down, just stunning. The treetop walk at O’Reillys was a world first when it was built in 1987 but now even 30 years later it’s still right up there with the best. It branches off from the Booyong boardwalk before you get to the botanic gardens. It’s also one of the few that I know of that is still free. It’s made up of 9 suspension bridges up to 16 metres above the ground plus there’s a tower you can climb for views 30 metres above the ground up in the canopy. We actually did this tour on a previous visit to O’Reilly’s and absolutely loved it. Nothing like combining your passion for tea with these incredible views, a fabulous storyteller in our guide Kat and even a little flute music to sip your tea by. 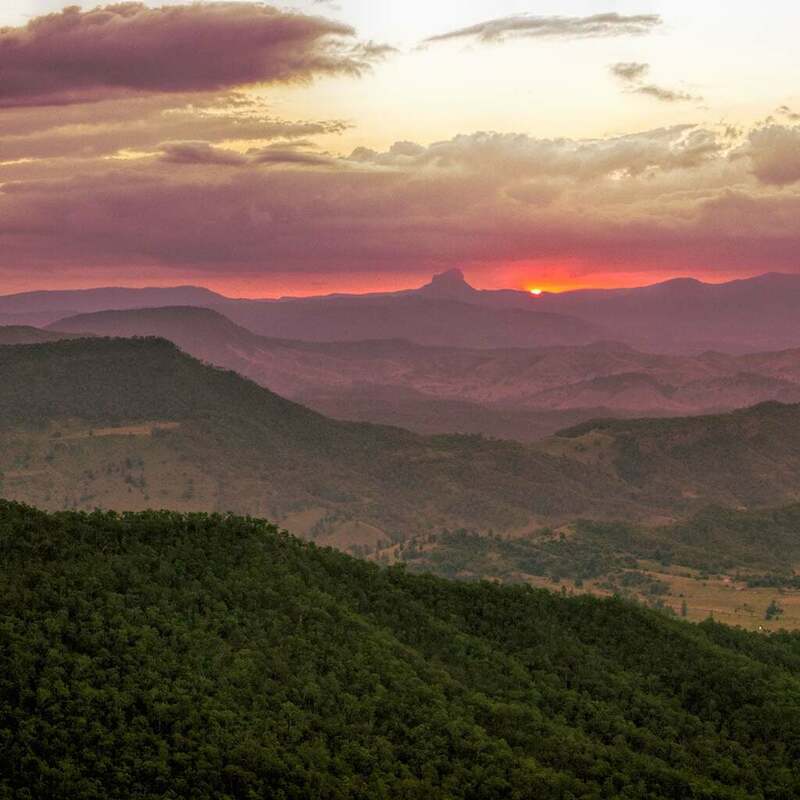 You can learn more about our Billy Tea experience at Lukes Bluff Lookout and a bit of Australiana culture in this post. 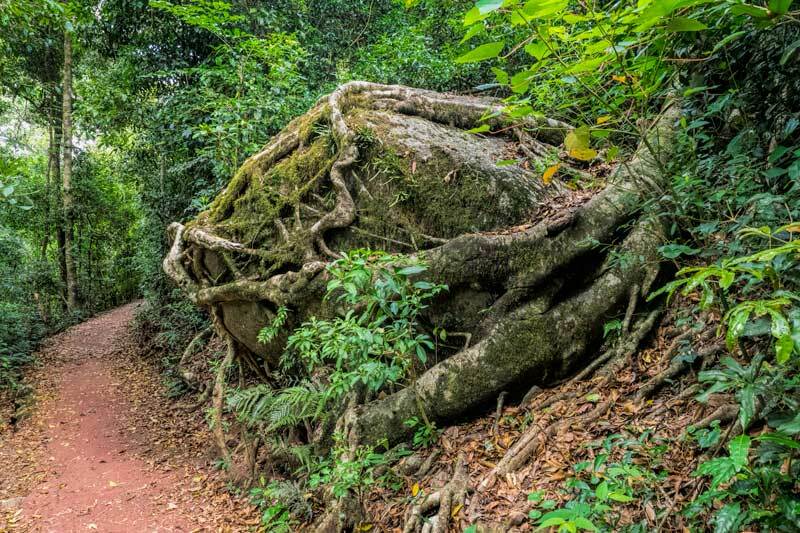 We can’t overlook the selection of walking tracks in the Lamington National Park. Many of them leave from right opposite reception, other from a short walk away and a few are easier to drive to save your legs for walking an extra section of track. The official walking map is on the Department of National Parks website but we found their onsite office was closed on the three days we were there so you couldn’t get a hard copy from them. There’s a large map displayed just outside the shop and you can buy a paper map for $2 in the O’Reillys store. If you aren’t familiar with hiking in Australia we’ve published information on the grading of hiking tracks in Australia. Make sure you carry plenty of drinking water and appropriate supplies, and always let someone know where you are going. In O’Reillys reception there’s a book to note it down, that way if you run into difficulty someone knows where to look for you. There was a full search and rescue mission while we were there when tourists had headed out without water or any provisions and spent two unplanned nights in the bush. Unless you’re a very experienced hiker stay on the trails, there is so much to see, you’ll have an amazing time and will come home safe. 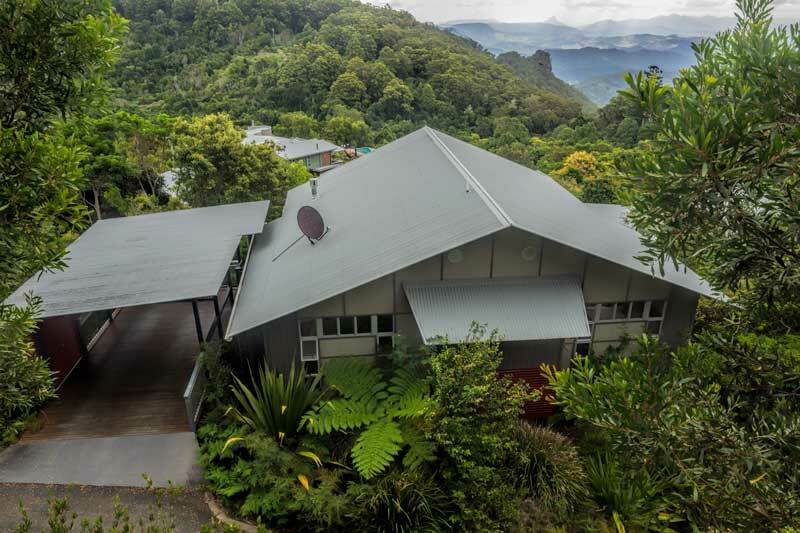 The O’Reillys Rainforest Retreat is located at the end of Lamington National Park Rd, Canungra QLD 4275. If you visit for a day trip there is plenty of parking, picnic tables, barbeques and toilet facilities available. There is also a store, cafe or restaurant on site. 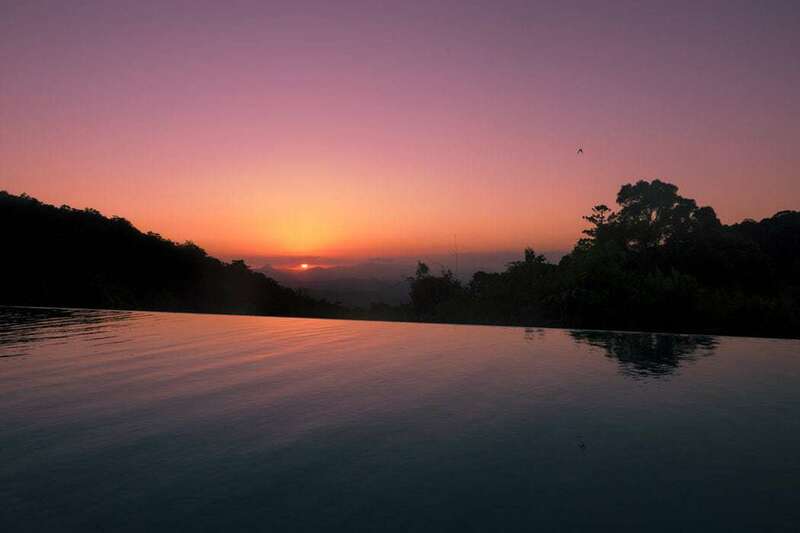 If you have the chance we recommend staying few a few nights to enjoy the dawn, dusk and night in a rainforest too. 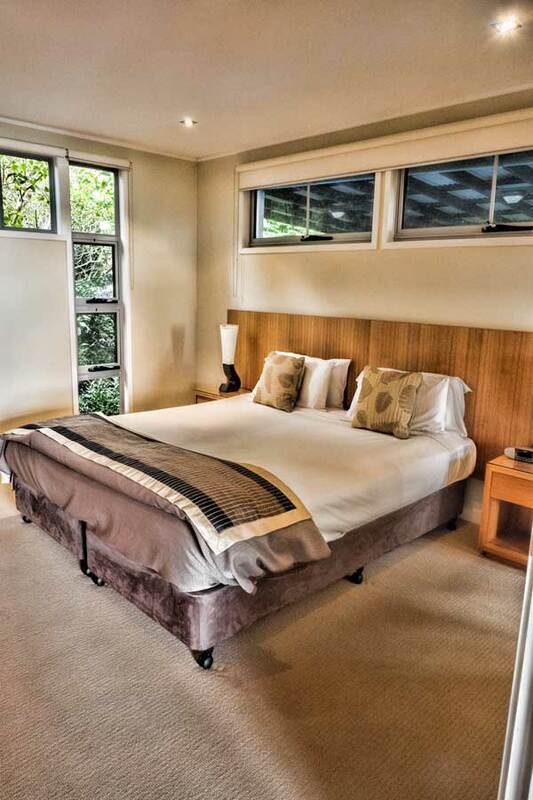 There’s a range of accommodation options from camping to the luxury villas we stayed in, there’s also a variety of rooms in between to suit different budgets and preferences. 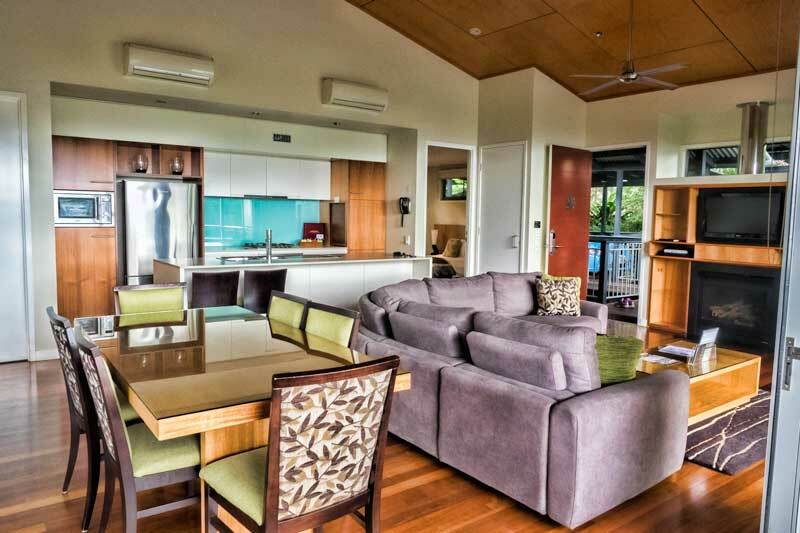 To plan your own stay at O’Reillys Rainforest Retreat book direct here or through the Hotels Combined Portal. Hover and click the save button to share this article with others on Pinterest. Thanks for all the information. I’m surprised the Treetops walk is free. I will need to make my way down there sometime, especially to do some hiking. OMG!!! This is area is absolutely stunning. the view from that balcony is just AMAZING!!! I think I can just stare at the beauty of the landscape all day with a glass of cheeky wine. Seems like you had a lovely retreat in O’Reillys National Park. Another great addition when visiting Australia. Those photos look amazing. The sunsets are certainly worth waiting for. It has been awhile since I’ve been to O’Reilly’s and I don’t live that far! The accommodation looks very chic. It is a gorgeous place to soak the tired muscles and relax at the end of the day. This is beautiful! I pinned it so I make sure it doesn’t get left off of things to do when I travel to Australia. The glow worms night walk seems magical! Great post! This resort looks like my idea of heaven. 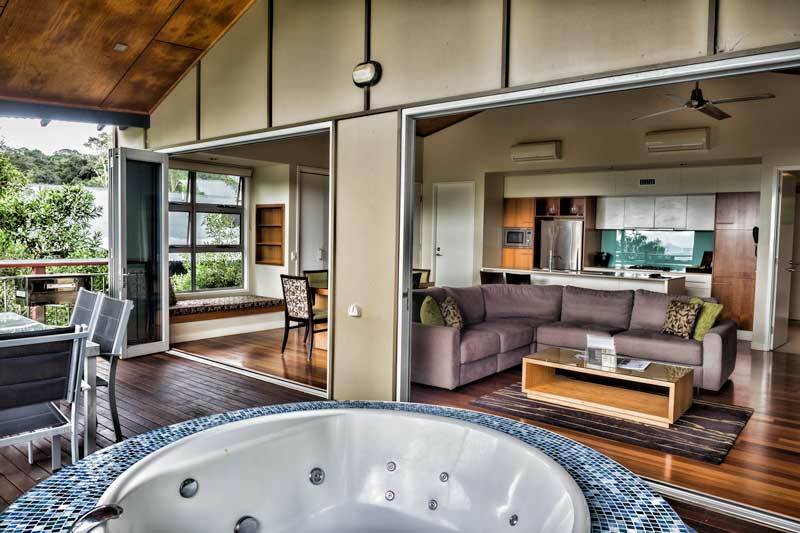 The accommodation looks really gorgeous, lots of space, luxurious and oh my goodness to the jacuzzi tub on the balcony deck. Being able to see flora and fauna in its natural habitat is such a relaxing joy too. OMG! I never heard of this place but after seeing this, I want to get there now. Looks so beautiful and never knew that there were rainforests in Aussieland. Wow. Just incredible to stay in amongst all this nature! It all looks so green and peaceful. 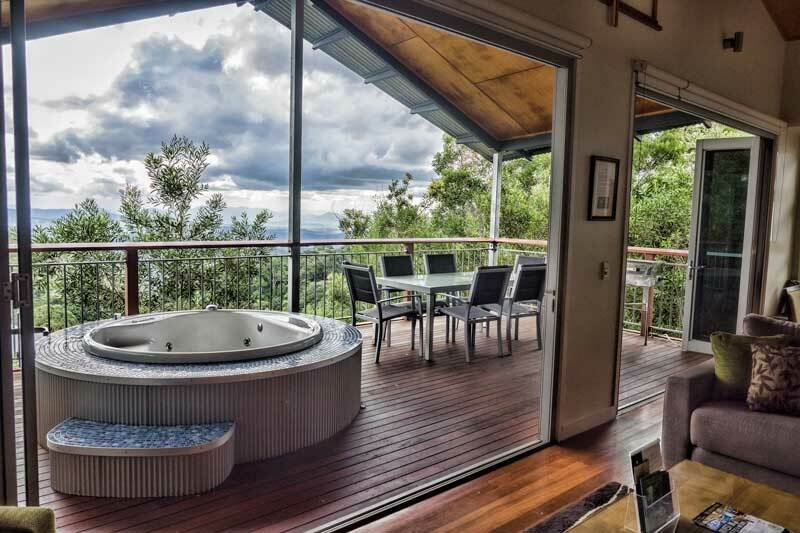 That hot tub with that view is just perfection. Also, the morning bird walk would be an amazing thing to go on as well. Well this has certainly gone to the top of my travel list! What a fantastic few days you had. I have been to the park several years ago, but just for a few hour day hike. We looked for pademelon, and might have seen one in the bush, in the distance, but certainly nothing like the one you shared here. I would love to spend a few days relaxing and hiking at this retreat, especially the sunset hikes, glowworms and morning birds. We are always looking for weekend getaways. I had no idea there were rainforests in Aussie! I imagined it to either be coastal, cities or outback! I’ll be sure to add this to my Aussie trip list, thanks!